In this week’s study from Tehillim / Psalms 150:1-6, the psalm opens saying א הַלְלוּיָהּ | הַלְלוּ-אֵל בְּקָדְשׁוֹ הַלְלוּהוּ בִּרְקִיעַ עֻזּוֹ: 150:1 Praise the Lord! Praise God in His sanctuary; Praise Him in His mighty expanse. (NASB) When the psalmists speaks of praising God in His sanctuary, is he referring to the earthly sanctuary or the heavenly sanctuary? The reference to the mighty expanse, is this to all of the universe? The psalmist continues saying, ב הַלְלוּהוּ בִּגְבוּרֹתָיו הַלְלוּהוּ כְּרֹב גֻּדְּלוֹ: 150:2 Praise Him for His mighty deeds; Praise Him according to His excellent greatness. (NASB) The great deeds the Lord is praised for, are these a reference to His miracles, to his creation, or to the way he works in our lives? The method in which the psalmist speaks of to bring praises to the Lord, he says, ג הַלְלוּהוּ בְּתֵקַע שׁוֹפָר הַלְלוּהוּ בְּנֵבֶל וְכִנּוֹר: ד הַלְלוּהוּ בְתֹף וּמָחוֹל הַלְלוּהוּ בְּמִנִּים וְעוּגָב: ה הַלְלוּהוּ בְצִלְצְלֵי-שָׁמַע הַלְלוּהוּ בְּצִלְצְלֵי תְרוּעָה: 150:3 Praise Him with trumpet sound; Praise Him with harp and lyre. 150:4 Praise Him with timbrel and dancing; Praise Him with stringed instruments and pipe. 150:5 Praise Him with loud cymbals; Praise Him with resounding cymbals. (NASB) The ancient way to praise the Lord is in singing. This is illustrated by the Psalmists statements to praise God with the harp, lyre, timbrel, stringed instruments, pipe, and cymbals. He also refers to dancing which provides an illustration of how one lives his life. The Psalm concludes saying, ו כֹּל הַנְּשָׁמָה תְּהַלֵּל יָהּ הַלְלוּיָהּ: 150:6 Let everything that has breath praise the Lord. Praise the Lord! (NASB) This statement refers to the created creature, all those who live on earth, both man and beast, birds and creeping things, as well as those created things in heaven, from plant life to the angels. In this week’s study from Tehillim / Psalms 150:1-6, the psalm opens saying א הַלְלוּיָהּ | הַלְלוּ-אֵל בְּקָדְשׁוֹ הַלְלוּהוּ בִּרְקִיעַ עֻזּוֹ: 150:1 Praise the Lord! Praise God in His sanctuary; Praise Him in His mighty expanse. (NASB) When the psalmists speaks of praising God in His sanctuary, is he referring to the earthly sanctuary or the heavenly sanctuary? The reference to the mighty expanse, is this to all of the universe? The study of the sanctuary is crucial for understanding God’s plan for salvation. Based upon the Apostolic Writings, the author of the book of Hebrews (9:23-24) states that there was a heavenly sanctuary of which the Lord God had shown Moshe and David how to make an earthly sanctuary. In the Tanach, there is a connection between the earthly sanctuary and the heavenly sanctuary. We remember that the Lord God showed Moshe the pattern of the sanctuary that he was to build (Shemot / Exodus 25:40). The Tabernacle represented God’s presence in the midst of His people in a covenant relationship with His chosen people. (Shemot / Exodus 15:17, 25:8) It is through the sanctuary that the people of Israel would draw near, worship, and interact with God through the service of the temple (i.e. Shelamim Korban, Peace offerings). In the wilderness, we read in the Torah that God’s glory was manifest in the pillar of cloud during day and fire during night. Later on in history, the glory of God was manifest in the cloud during the dedication of the Temple. We are also told in the book of Hebrews, that Yeshua the Messiah had the fullness of the glory of God upon him. God’s presence in the midst of the people demanded obedience beginning with their leaders, Moshe and Aaron. The Tabernacle by its nature symbolizes God’s choice to dwell with His people where we are His representatives bearing His testimonies (1 Kings 6:12-13). God’s presence illustrates his omnipresence in His ability to see all things (Mishley / Proverbs 15:3, Job 34:21, Jeremiah 16:17, 2 Chronicles 16:9, Tehillim / Psalms 34:15). The establishment of the dwelling place of God was assurance of God’s presence among His people (1 Kings 9:3). The plan of God for His people was that we are “to do all that is written in the law of the Lord which He commanded Israel” (1 Chronicles 16:40). HaShem revealed the plan of God to David and Moshe. In Moshe’s case, we read in the Hebrew bible that the Lord God allowed Moshe to see something with His eyes ט כְּכֹל אֲשֶׁר אֲנִי מַרְאֶה אוֹתְךָ אֵת תַּבְנִית הַמִּשְׁכָּן וְאֵת תַּבְנִית כָּל-כֵּלָיו וְכֵן תַּעֲשֹוּ: (Shemot / Exodus 25:9, 1 Chronicles 28:10). The verb מַרְאֶה mareh, “showing” implies that God allowed Moses to see in a real image of what He was to build, or to see the original version (27:8). 1 Chronicles 28:11-12 writes, “Then, David gave to Solomon, his son the plan of the porch and its houses, and its treasuries, and its upper rooms, and its inner chambers, and the room of atonement. In addition, the entire plan he had by the spirit with him concerning the courts of the house of God and for all the surrounding chambers: the treasuries of God’s house, and the treasuries of the votive offerings” The basic conclusion is that Moshe was shown a pattern from which he was to make a copy of what was in heaven (Shemot / Exodus 25:9, 1 Chronicles 28:11-19). With this understanding of Moshe making a copy, a replica, a reproduction of what he had seen, we can interpret this for example as the author of the book of Hebrews states, the earthly sanctuary being a pattern of the heavenly sanctuary. Indeed, Shemot / Exodus 25 and 1 Chronicles 28 indicate that the heavenly temple provided a pattern for the earthly one. While God was the Designer and Originator of the sanctuary, Moses, David, and Solomon were only persons who were called to build these places. The reason the Lord God desired to dwell among His people, was to accomplish His covenant agreement and to have a relationship with His people. The earthly Tabernacle associates God’s people to the heavenly one. This connection between the heavenly and the earthly tabernacles, was necessary to help us understand God’s plan for salvation, the gospel message, and to demonstrate mankind’s difficulties with sin. In addition, the manner in which the Lord God Almighty had planned for His Spirit to dwell in our hearts and to empower us to overcome sin in our lives. The heavenly sanctuary is the conceptual entity from which the earthly sanctuary draws its function and upon which it depends for its significance. Ultimately this is the power of God in our lives and having the Lord God Almighty dwelling in our midst, in our hearts, we are called to obediences as well. Paul speaks of the need to learn to devote ourselves to doing what is good. He connects this to being able to provide for the daily necessities and for not living unproductive lives. Paul is referring to working at an honest job, to obeying God’s commands, and taking care of (providing for) our families, and it is within these things the Lord God is pleased. The greatness of God working in our lives is found within these things, the Lord blesses us and we can glorify the Lord in all that we do. Every day the Lord God provides for us, even in the most extraordinary and difficult circumstances. The Lord God also changes our hearts. The Lord changes our hearts so that we can accomplish His will in our lives, to live according to His Word, to bear His testimony, and to serve Him. We read Solomon saying in Mishley / Proverbs 21:2 “The king’s heart is in the hand of the Lord. Like the rivers of water, He turns it wherever He wishes.” (NKJV) Solomon claims the Lord God directs the kings heart. This is important as it relates to the Lord guiding and directing our leadership and provides all the more reasons for praying for our leaders. Additionally, reasons to praise the Lord is in how He protects His people. Not just in times of the enemy coming against us, but also in times of hardship. The Lord God Almighty protects us and we don’t always know how or what He does until much later. This is how the Lord God empowers us by taking us through these challenging events in our lives. The Lord said, Devarim / Deuteronomy 31:6 Be strong and courageous, do not be afraid or tremble at them, for the Lord your God is the one who goes with you. He will not fail you or forsake you. (NASB) The Lord God gives us the greatest amount of His power and strength when life is in its darkest hours. The Lord also works in the hearts and minds of the enemy such that justice reigns found in his ability to confound the works of the unrighteous person. Remember the phrase, “Whatever doesn’t kill us will make us stronger.” That quote is attributed to the German philosopher, Friedrich Nietzsche. He said it much more eloquently saying, “That which does not kill us, makes us stronger.” It turns out that he was right. The Lord God uses adversity to make us stronger, to build our faith, so that we will trust in Him. The key to this aspect is to run towards the Lord God and not away from Him during times of trial. The Lord God uses trials to do many things. It was through trials that this ministry got started and I am thankful that I did not turn my back on the Lord when times got tough. It is in these things that the Lord builds our character and who we are at the inner most being. Just as the Lord God allowed Lazarus to die so that He could demonstrate His power over death by raising him back to life (see John 11), at times the Lord God also allows us physical illness so that He can heal us for His glory. He is the Great Physician and has the ability to heal and He does so in ways that reveal how He is completely in control. It is also through these dark times that the Lord develops our wisdom in life. The Lord also gives us direction and purpose during these times, leading us on the path that draws us nearer to Him. The method in which the psalmist speaks of to bring praises to the Lord, he says, ג הַלְלוּהוּ בְּתֵקַע שׁוֹפָר הַלְלוּהוּ בְּנֵבֶל וְכִנּוֹר: ד הַלְלוּהוּ בְתֹף וּמָחוֹל הַלְלוּהוּ בְּמִנִּים וְעוּגָב: ה הַלְלוּהוּ בְצִלְצְלֵי-שָׁמַע הַלְלוּהוּ בְּצִלְצְלֵי תְרוּעָה: 150:3 Praise Him with trumpet sound; Praise Him with harp and lyre. 150:4 Praise Him with timbrel and dancing; Praise Him with stringed instruments and pipe. 150:5 Praise Him with loud cymbals; Praise Him with resounding cymbals. (NASB) The ancient way to praise the Lord is in singing. This is illustrated by the Psalmists statements to praise God with the harp, lyre, timbrel, stringed instruments, pipe, and cymbals. He also refers to dancing which provides an illustration of how one lives his life. In Tehillim / Psalms 144:9 the psalmist states “I will sing a new song to you, O God!” It is a joyous time when we have a new song because we hear how the Lord God has worked on the person’s heart to write the song. This is to glorify God by music. God is glorified when we sing praises to Him. The Lord also loves to hear His children sing. In Tehillim / Psalms 147:7 the psalmist states, “Sing to the Lord with thanksgiving!” In the song of thanksgiving, we are recognizing how much we love and are thankful for what the Lord has done for us. This is related to what the Lord has done for us in the past. We can praise the Lord for His powerful deliverance of His people in the Scriptures, and we look forward to His doing so for us as well. We praise the Lord in the good times, as James writes in James 5:13 “Is anyone among you suffering? Then he must pray. Is anyone cheerful? He is to sing praises.” There are many things we can be thankful for, a new birth, a job, a wedding, food on the table, and a roof over our heads. The Scriptures also show David for example of praising the Lord even during difficult times. When difficult times come, it is a natural response to get mad and discouraged. Because of our relationship with the Lord and His Messiah Yeshua, we know that difficult times do not last forever. This causes us to have hope. One example of having a future hope was when Paul and Silas were beaten in Acts 16:22-25. Paul and Silas had been accused and beaten with many blows (16:23) and then thrown in prison. Paul and Silas while in jail were praying and singing songs of joy to the Lord. The Scriptures say that the Lord heard their prayers and their praise and the foundations shook, there was an earthquake so that all of the doors were opened. The Jailer woke seeing all of the doors open and he was going to kill himself. But Paul delivered him telling him that no one had left (escaped) and then told him about Yeshua the Messiah. He and his whole household were saved. This illustrates how troubling times are passing. The peace that Paul and Silas had in their hearts was made known by their faithful prayers and singing unto the Lord. They knew that God was their reward and knowing the Lord was worth the price of being beaten, and even of death. They demonstrate that having this kind of mindset, we as believers can make it through any hard time and God will always be glorified when we sing praises even in the hard times. The Psalm concludes saying, ו כֹּל הַנְּשָׁמָה תְּהַלֵּל יָהּ הַלְלוּיָהּ: 150:6 Let everything that has breath praise the Lord. Praise the Lord! (NASB) This statement refers to the created creature, all those who live on earth, both man and beast, birds and creeping things, as well as those created things in heaven, from plant life to the angels. We are thankful and give praise to the Lord for all that He has done! Let’s Pray! 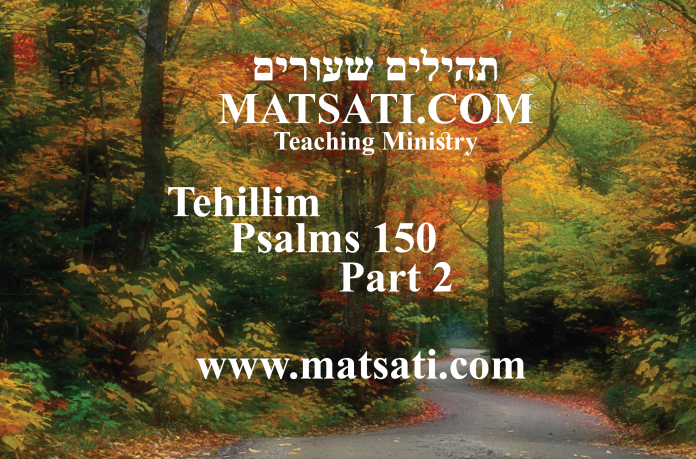 The Rabbinic Commentary (Midrash) on Tehillim / Psalms 150 has 1 part. Reading through the Midrash we will be looking at Part 1. Let’s begin by outlining Midrash Tehillim Chapter 150, Part 1, 2, 5, and 6. The משל (mashal) “the parable,” goes on to explain the פתיחתא (Petihta), the rabbis say the Lord will make His name known in the midst of His people. What exactly does that mean? The נמשל (Nimshal) “expansion on the parable” expands upon the משל (mashal), the rabbis give many examples of the way in which the Lord will make His name known. א הללויה הללו אל בקדשו. אמרה רוח הקודש על ידי יחזקאל ואת שם קדשי אודיע וגו׳ הנה באה ונהיתה (יחזקאל לט ז ח), אימתי הגוים יודעים שאני קדוש, כשאני עושה בהם מה שכתוב למעלה מן הענין, שנאמר ואתה בן אדם הנבא על גוג וגו׳, ושובתתיך וגו׳ והכיתי קשתך מיד שמאלך (שם שם יחזקאל ל״ט א ב ג), ודם נשיאי הארץ תשתו, ואכלתם (בשר) [חלב לשבעה] ושתיתם דם [לשכרון] מזבחי אשר זבחתי לכם (שם שם יחזקאל ל״ט יח יט), ולא פירש יחזקאל, כמה זמן החיה והעוף אוכלות בנבלתו של גוג, ובא ישעיה ופירש, שנאמר וקץ עליו העיט וכל בהמת הארץ עליו תחרף (ישעיה יח ו), הרי י״ב חדש עושה על גוג, קיץ וחורף י״ב חדשים, אימתי הקב״ה מתקדש בעולמו כשיפרע מן הרשעים, וכה״א למעלה מן הפרשה לעשות בהם משפט כתוב, אותו שעה הוא מתקדש בעולמו, שנאמר הללו אל בקדשו, הללוהו במה שעשה לקדושיו, ומי הן קדושיו, ישראל, שנאמר כי עם קדוש וגו׳ (דברים ז ו), וכתיב קדש ישראל וגו׳ (ירמיה ב ג) , לכך נאמר הללו אל בקדשו הללוהו ברקיע עוזו, הללוהו במה שעשה ברקיע עוזו, ומה עשה ברקיע, ונמקו כל צבא השמים (ישעיה לד ד), וכתיב שאו לשמים עיניכם והביטו אל הארץ מתחת כי שמים כעשן נמלחו וגו׳ (שם ישעיהו נא ו), הללוהו ברקיע עוזו, מה עוזו הללוהו במה שעשה בעזים שברקיע, ומי הם עזים שברקיע, אלו שרי אומות העולם, וכה״א והפכתי כסא ממלכות (חגי ב כב), מהו והפכתי, שהוא הופכם מן הרקיע לארץ, ואח״כ וירדו סוסים ורוכביהם וגו׳ (שם שם חגי ב׳), אלו שבארץ, וכה״א כי רותה בשמים חרבי הנה על אדום תרד וגו׳ (ישעיה לד ה), מרוה אותה ומפילה משרה, ואח״כ יורדת עליה, וכה״א חרב לה׳ מלאה דם וגו׳ (שם שם ישעיהו ל״ד ו). תם ונשלם. The midrash opens with the Lord speaking through Ezekiel saying that He will make His name known to the nations and his name will not be profaned again. The midrash quotes from Ezekiel 39 to explain how the Lord will achieve this. Behold, it comes and it will be done (Ezekiel 39:7-8). When will the nations know that I am the Holy One? When I fulfill what the earlier passage declares, and you, son of man, prophecy against Gog, and say, Thus says the Lord God, Behold, I am against you, O Gog, and I will turn you about, and lead you on, and will cause you to come up from the uttermost parts of the north; and I will bring you upon the mountains of Israel; and I will smite your bow out of your left hand, and I will cause your arrows to fall out of your right hand. You will fall upon the mountains of Israel, you, and all your bands, and the peoples that are with you; I will give you unto the ravenous birds of every sort and to the beasts of the field, to be devoured. You will fall upon the open field; for I have spoken it, says the Lord God (Ezekiel 39:1-5). The first mention of the name Gog occurs in the Book of Ezekiel, where Gog is an individual and Magog is his land. According to Bereshit / Genesis 10, Magog is a person, the son of Japheth, the son of Noah. Gog is not mentioned, but the man Magog is mentioned and is the name of this land which is attributed to him. According to the book of Revelation, Gog and Magog together are the hostile nations of the world. The aggadah, homiletic, and midrashic rabbinic literature of Judaism, treat Gog and Magog as two names for the same nation who will come against Israel in the final war. (Encyclopaedia Judaica, Skolnik & Berenbaum 2007, p. 684) The rabbis associated no specific nation or territory with them beyond a location to the north of Israel, (Mikraot Gedolot HaMeor) but the great Jewish scholar Rashi identified the Christians as their allies and said God would thwart their plan to kill all Israel. (Grossman, Avraham (2012). “The Commentary of Rashi on Isaiah and the Jewish-Christian Debate”. In Wolfson, Elliot R.; Schiffman, Lawrence H.; Engel, David. Studies in Medieval Jewish Intellectual and Social History. Brill. p. 54. ISBN 9789004222366) The Gog prophecy mentioned here in the book of Ezekiel is to be fulfilled at the approach of what is called the “end of days.” Jewish eschatology views Gog and Magog as enemies to be defeated by the Messiah, which will usher in the age of the Messiah. Christianity’s interpretation on Gog and Magog is apocalyptic in nature associating Gog and Magog to the spirit realm and being allies of Satan against God at the end of time, as can be read in the Book of Revelation. The legend of Gog and Magog were also integrated into the Alexander the Great romances, and into the Islamic literature. The Gog and Magog can be tied to Magog the Japhetite in Bereshit / Genesis 10, and there are a string of names following, Meshech, Tubal, Gomer, are all the sons of Japheth, and therefore brothers of Magog. Of Gog’s allies, Meshech and Tubal were kingdoms in central Anatolia north of Israel, Persia is towards the east, Cush (Ethiopia) and Put (Libya) are to the south, Gomer is the Cimmerians, a nomadic people north of the Black Sea, and Beth Togarmah was on the border of Tubal. This list of names and corresponding nations represents the multinational alliance that is surrounding Israel, who will come against Israel in an attempt to destroy her, of which God says that He will ultimately destroy them and the result will be that His name will not be blasphemed again. And you, son of man, thus says the Lord God, Speak unto the birds of every sort, and to every beast of the field, Assemble yourselves, and come; gather yourselves on every side to My feast, upon the mountains of Israel, that you may eat flesh and drink blood. The flesh of the mighty will you eat, and the blood of the princes of the earth will you drink; rams, lambs, and goats, bullocks, fat-lings of Bashan are they, all of them. And you will eat fat till you be full, and drink blood till you be drunken of My feast which I have prepared for you (Ezekiel 39:17-19). Ezekiel did not plainly declare how long the beasts and the birds would feed upon the flesh of Gog. But when Isaiah came, he plainly declared how long it would be, saying, They will be left together unto the ravenous birds of the mountains, and to the beasts of the earth. And the ravenous birds will summer upon them, and all the beasts of the earth will winder upon them (Isaiah 18:6). Behold, then! They will feed upon Gog for twelve months, for winter and summer together make twelve months. When will the Holy One blessed be He, be hallowed in His world? When He punishes the wicked. As the preceding Psalm says, To execute upon them the judgment written; He is the glory of all His saints. Praise you the Lord (Tehillim / Psalms 149:9). The midrash is quoting from Ezekiel 39 in regards to the birds and the beasts consuming the flesh of the wicked. The concept of the Lord being exalted when He exacts judgment upon the wicked, is found in Isaiah 5:13-25. Here Isaiah is explaining the reasons why Israel was going into exile, because of unrighteousness, falsehood, and sin. These are those who exchange light for darkness and call good evil (5:20). In Isaiah 5:16 states “But the Lord of hosts will be exalted in judgment, And the holy God will show Himself holy in righteousness.” He parallels these to those who make themselves to be heroes in drinking alcohol (5:22) and who think they are wise in their own eyes (5:21), and justify the wicked for a bribe (5:23). This is in the context of the prophet calling the Lord to come quickly and exact His judgment upon those who are not His. The power of God moves against those who do not seek righteousness, and the mountains quake, and Isaiah says that their corpses will lay in the middle of the streets due to the Lord bringing judgment upon the wicked. The Torah teaches us to love one another and to love God. The idea of seeking the destruction of others is contrary to the merciful lovingkindness God has shown to us. Then will He be hallowed in His world, as it is said Praise God because of His holy one (Tehillim / Psalms 150:1) that is, praise Him because of what He does for His holy ones. And who are His holy ones? Israel, to whom it is said For you are a holy people unto the Lord your God (Devarim / Deuteronomy 7:6), and of whom also it is written Israel was holiness unto the Lord (Jeremiah 2:3). Hence it is said, Praise God because of His holy one. Praise Him in the firmament of His power (Tehillim / Psalms 150:1) that is, praise Him for what He will do in the firmament with His power. And what will He do in the firmament? All the host of heaven will moulder away, and the heavens will be rolled together as a scroll, and all their host will fall down (Isaiah 34:4); and it is told further, lift up your eyes to the heavens, and look upon the earth beneath; for the heavens will vanish away like smoke, an the earth will wax old like a garment, and they that dwell therein will die in like manner (Isaiah 51:6). Another comment, Praise Him in the firmament of His power. In view of the word power, how is the verse to be read? Praise Him for what He will do to the powerful ones in the firmament. And who are the powerful ones in the firmament. They are the guardian angels of the peoples of the world. Midrash Tehillim 150 Part 1 concludes saying, “As Scripture says, I will overthrow the throne of kingdoms, and I will destroy the strength of the kingdoms of the nations (Haggai 2:22). And what does I will overthrow the throne of kingdoms signify? That God will throw down the guardian angels from heaven to earth. And then the horses and their riders will come down, etc. that is the peoples of the world that are watched over by their guardian angels. And as Scripture says, My sword has drunk its fill in heaven; behold, it will come down upon Edom, and upon the people of My ban, to judgment (Isaiah 34:5). That is, after God had let His sword drink its fill, He will make the sword of Edom’s guardian angel fall from his hand, and it will come down upon Edom. And Scripture goes on to say, The sword of the Lord is filled with blood, it is made fat with fatness, with the blood of lambs and goats, with the fat of the kidneys of rams; for the Lord has a Sacrifice in Bozrah, and a great slaughter in the land of Edom, for the Lord has a day of vengeance, a year of recompense for the controversy of Zion (Ezekiel 34:6-8)” When you think of “guardian angels” what kind of imagery comes into your head? A guardian angel is an angel that is assigned to protect and guide a particular person, group, kingdom, or country. Belief in guardian angels can be traced throughout all antiquity. The concept of angels that guard over particular people and nationalities played a common role in Ancient Judaism. In the Rabbinic literature, the Rabbis expressed the notion that there are guardian angels appointed by God to watch over people. We read throughout the Scriptures, that angels were involved in men’s affairs acting as intermediaries between God and man where the Lord would send His angels when there was a need. Yeshua the Messiah also said, “See that you despise not one of these little ones: for I say to you, that their angels in heaven always see the face of my Father who is in heaven.” (Matthew 18:10). We are told angels attended Yeshua after the temptation in the wilderness, and how he was visited by angels in the garden prior to the crucifixion. In Acts 12:12-15, after Peter had been escorted out of prison by an angel, he went to the home of “Mary the mother of John, also called Mark.” The servant girl, Rhoda, recognized his voice and ran back to tell the group that Peter was there. However, the group replied: “It must be his angel”’ (Acts 12:15) not believing that God had delivered him out of the jail. Because of these words about Peter’s angel, this became the most commonly depicted guardian angel in art, and was normally shown in images of the subject, most famously Raphael’s fresco of the Deliverance of Saint Peter in the Vatican. The author of the book of Hebrews wrote saying, Hebrews 1:14 “Are they not all ministering spirits, sent to minister for them, who shall receive the inheritance of salvation?” In the epistle of Jude, we also read of Michael being described as an archangel who disputed with Satan. In light of all of these references one may conclude the function of the guardian angel is to lead the people of God to the Kingdom of Heaven. In Judaism, in Rashi’s commentary on Daniel 10:7 he says, “Our Sages of blessed memory said that although a person does not see something of which he is terrified, his guardian angel, who is in heaven, does see it; therefore, he becomes terrified.” So these references speak of the protection and assignment of the guardian angels to God’s people. It is interesting however how the Midrash states, “That God will throw down the guardian angels from heaven to earth. And then the horses and their riders will come down, etc. that is the peoples of the world that are watched over by their guardian angels.” If a guardian angel is a protector, why would the Lord cast them down? This leads us to the question of what kind of guardian angels do the nations have over them as compared to those who are God’s people? According to the Jewish encyclopedia, Samael (סַמָּאֵל “Venom of God,” “Poison of God,” or “Blindness of God”) is an important archangel in Talmudic and post-Talmudic lore, a figure who is the accuser (Ha-Satan), seducer, and destroyer (Mashhkit), and has been regarded as both good and evil. Rabbinical writings describe Samael as the guardian angel of Esau and a patron of Edom. Based upon the rabbinic literature, the evil one, Satan, is the guardian angel over the nations. Taking this into perspective, when one takes upon himself the ways of the nations, he is taking upon himself the ways of Satan. In Talmudic texts, Samael is a member of the heavenly host (with often destructive duties). One of Samael’s greatest roles in Jewish lore is that of the main archangel of death. He remains one of God’s servants even though he condones the sins of man. This evil guardian angel encourages sin and rebellion against God in the nations. He leads the people not to the kingdom of God, but to his kingdom, of death, deception, lies, idolatries, adulteries, immoralities, lusts, and all manners of sin. The Midrash continues saying, “And as Scripture says, My sword has drunk its fill in heaven; behold, it will come down upon Edom, and upon the people of My ban, to judgment (Isaiah 34:5). That is, after God had let His sword drink its fill, He will make the sword of Edom’s guardian angel fall from his hand, and it will come down upon Edom.” What we are being told here in the midrash is the Lord God Almighty is powerful to overcome these evil spirits in the heavenly places. Yeshua the Messiah, having been given power and authority over all, in His name we will not fall prey to the evil one and His ways. Just as the midrash states, the Lord God Almighty will protect us and deliver us when we seek and ask for His help. The Torah based interpretation is the Lord God Almighty chose to dwell in the midst of His people. We learn in the Apostolic Writings how by faith in God’s Messiah we are given His Holy Spirit to dwell in our hearts, to empower us to overcome sin and to not fear being possessed by demons because there is no place for evil spirits in our lives when we have the Lord God Almighty living in our midst. (1 Corinthians 3:16, 1 John 4:4, Romans 8:9-15 and 8:38-39). We may be tempted in this life, but we have been given the sword of the Spirit (Ephesians 6:17) and the power of God to overcome demonic influence (1 Corinthians 10:13). With the Lord God Almighty dwelling in our midst, evil must flee. Because of these things, we are confident of the Lord’s power emanating from us as we serve in dark places bringing the light of God’s love, righteousness, holiness, and truth to a lost world!